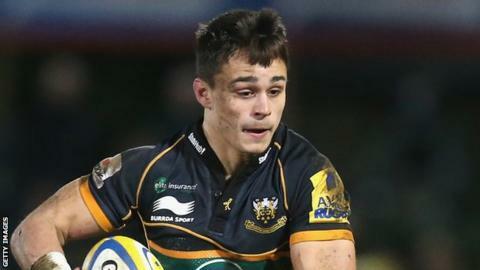 Northampton Saints have handed new deals to teenager Tom Collins and emerging fly-half Will Hooley. Wing Collins, 19, has scored one try in five Premiership starts this season, against Worcester in November, and impressed for Saints as cover for England's Luther Burrell at centre. Hooley, 20, has also had opportunities so far this term, acting as Stephen Myler's understudy at 10. His England Under-20 team-mate Alex Day has also signed a new deal. The 21-year-old scrum-half scored two tries in his first game this term, a win against Gloucester in November, and has gone on to make a further five appearances. Fellow academy products loose-head prop Danny Hobbs-Awoyemi, locks Alex Woolford and Jordan Onojaife, hookers Matt Williams and Reece Marshall, fly-half Sam Olver, wing Josh Skelcey and full-back Howard Packman have extended their own stays at Franklin's Gardens. "We think that they all have bright futures, and we're looking forward to seeing them develop here at Franklin's Gardens," said Saints director of rugby Jim Mallinder.